For many years the Town family owned and operated a market garden in Brandon. Cam took his tnrn working in the family business looking after gardens and produce. Cam's father picked up mail in Brandon and Cam also took part in this business. When Cam was a little older he discovered that there was better money and regular days off and benefits working for someone other than his father, so he moved on. Cam worked for many years at Bums and then Canada Post. In 1994 he was hired by the Town of Erickson and the RM of Clan william to work at their land­ fill. Cam also is a spare bus driver for the Rolling River School Division. In 1994 Cam met Colleen Larson (Fischer) and on September 20, 1998 they were married. This was the second marriage for both of them. Cam has three children from his previous marriage: James, born March 13, 1965 in Brandon, lives in Burnaby, BC and is a carpenter by trade. He has one son, Jesse James Town, born in 1988 in Brandon, MB. Scott, born March 14, 1967 in Brandon, and presently lives in Calgary and is working in the land­ scaping business. He lives with his fiancee, Shannon Black. Christina, born May 30, 1972 in Brandon, and her husband, Gamet Kinney, live in High River, AB, where they are both employed as teachers. Colleen has three children form her previous marriage and they are: Kristofer, born June 11, 1984 in Minnedosa, MB; Ashly, born March 23, 1986 in Minnedosa, MB; Apryl, born March 29, 1989 in Minnedosa, MB. 1995 on a temporary basis and in 1996 councils made the position a permanent one. In the spring of 1999 Colleen completed her studies and received her Certified Manitoba Municipal Administrator certificate from the University of Manitoba. 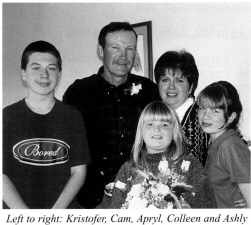 Colleen was born in 1959 in Gladstone, MB to Marge and Gerald Fischer, and raised in the Plumas and Bethany areas. 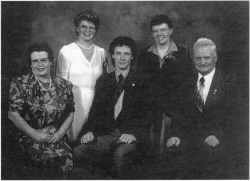 Gordon William Turner, the oldest son of William and Rose Turner, was born in the Lady Minto Hospital in Minnedosa on April 5, 1926. He attended school in Nedrob (1931-32) and Whirlpool (1932-39). He married Gladys Margret Stone, only daughter of Stanley and Lena Stone, on June 1, 1948, in the Bethel Lutheran Church. They farmed in the Whirlpool District and, in 1950, moved to Dauphin to start a career in plumbing, working for FW. Bumstead Ltd. In 1957 they moved to Lynn Lake, working for Hudson Bay Plumbing, then moved to Plin Flon and, in 1960, moved to The Pas where they started their own Plumbing and Heating business. They have three children: Dianne, Donna and Douglas.